Chicken – probably the most consumed meat in the world – can be prepared in many ways due to its neutral flavor that can be mixed with most ingredients. I personally love chicken breasts with mustard since it has a strong, sharp flavor that – to my opinion – pairs well with the neutral taste of chicken. My chicken breast salad has a creamy mustard dressing that I love making. Even though I rather eat salad with a light vinaigrette – or with just lemon juice and olive oil, I like to vary by trying out some creamy salad dressing that I make myself. I never buy commercial salad dressings since they are usually loaded with MSG, high-fructose corn syrup, sugar, too much sodium, additives and preservatives. This is lamb’s lettuce, also called field greens, machê, or nut lettuce. 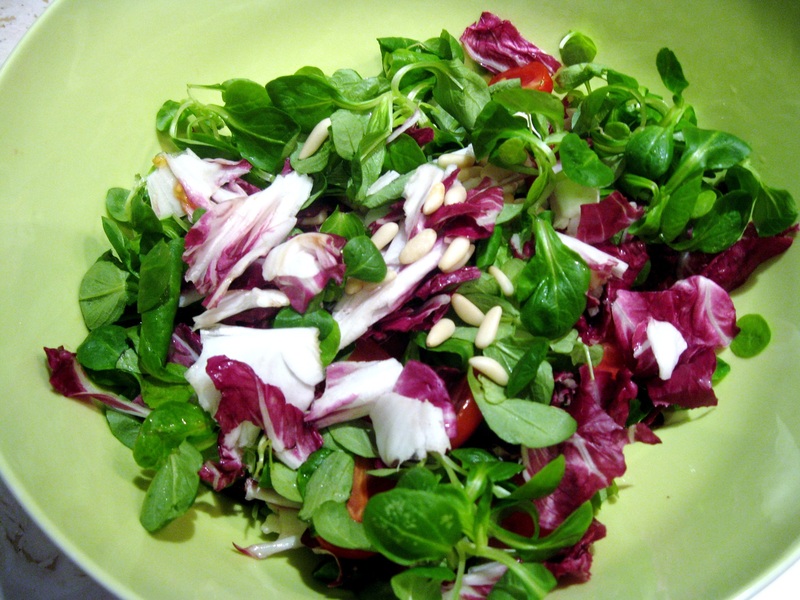 It has a nutty, tangy flavour – excellent for salads. 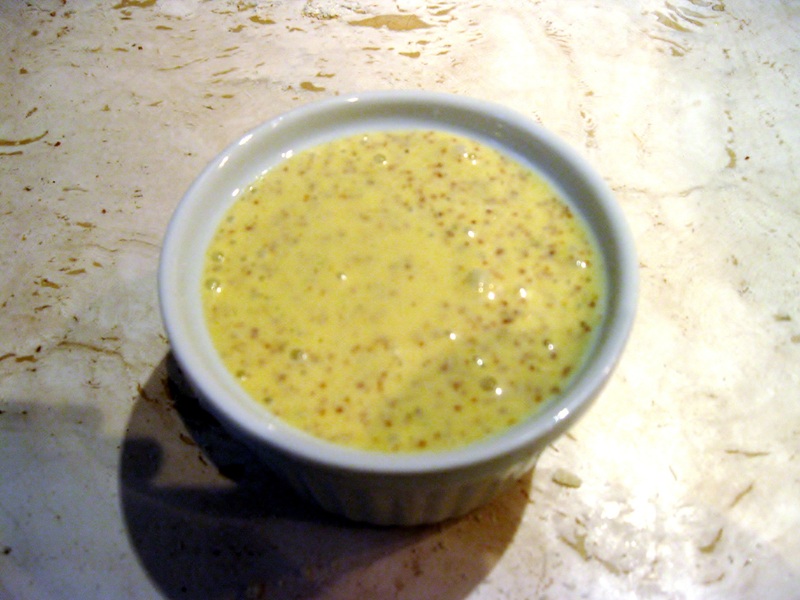 To make the sauce, combine all dressing ingredients and blend well until creamy. Refrigerate for about an hour or overnight. 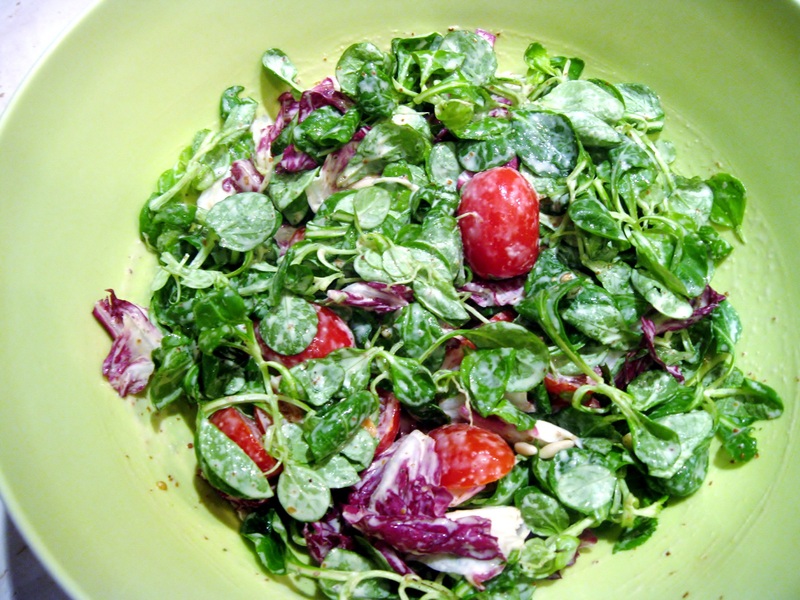 Cut tomatoes in halves and combine with lamb’s lettuce, radicchio, and pine nuts. Add dressing and toss well. 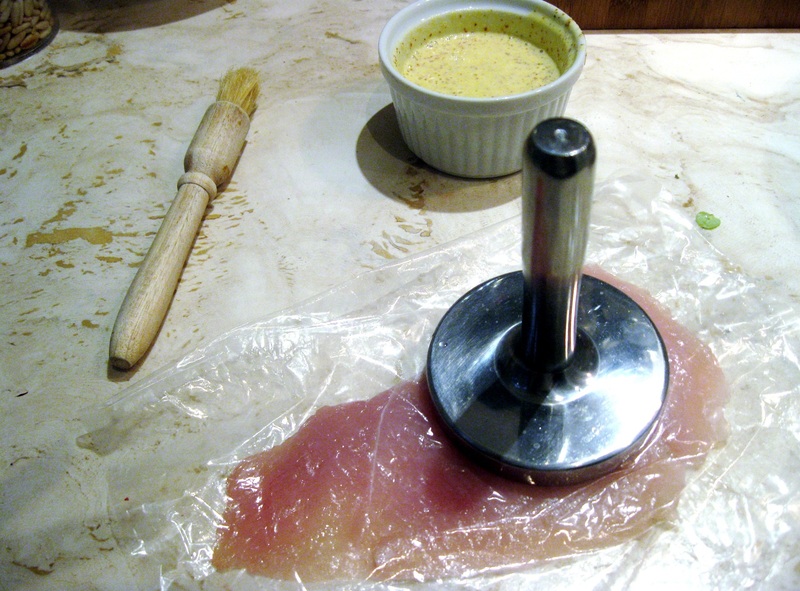 Meanwhile, with the use of a meat mallet pound chicken breast until very thin. When pounding, be careful not to tear chicken breasts! Season chicken breasts with salt and crushed red peppercorns. 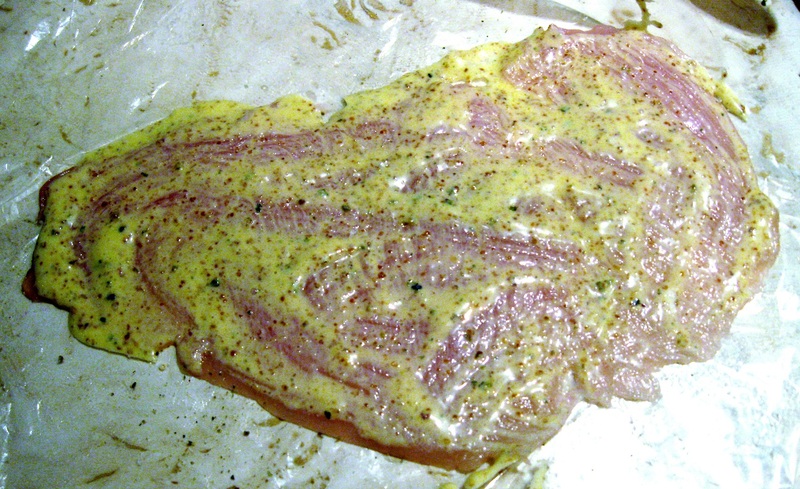 Rub some dressing on chicken breasts. 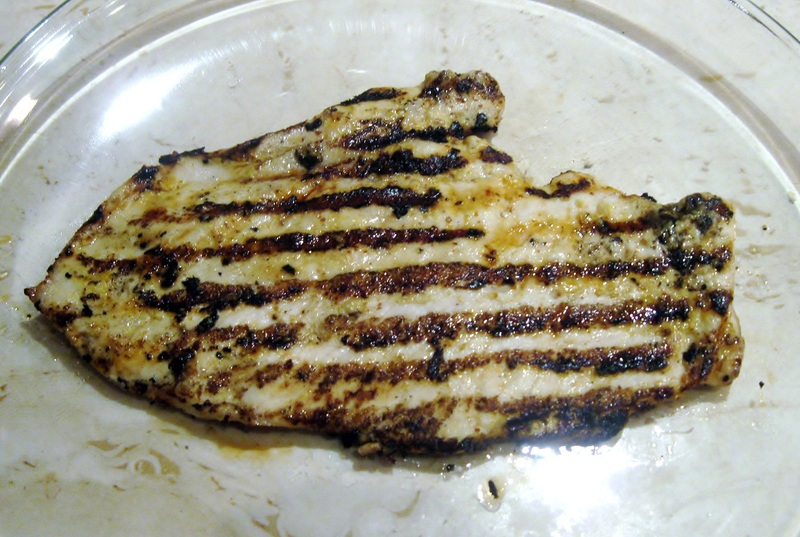 Heat olive oil on a grilling pan and place chicken breasts. Grill until done. 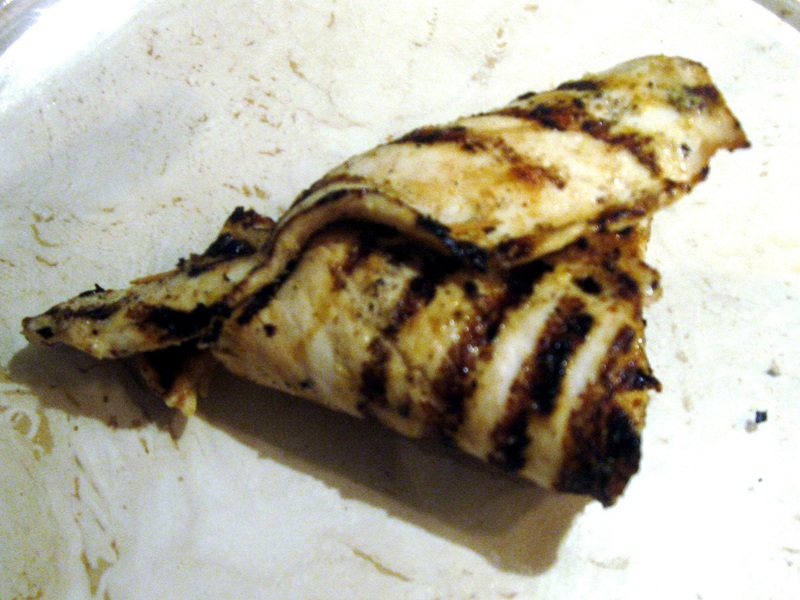 Using a toothpick, join together both ends of one of the longer sides of the chicken breasts. Fill each chicken cornucopia with the salad. Arrange chicken cornucopias on a plate and add more salad coming out of the cornucopia. Sprinkle with some crushed green peppercorns. I love recipes that add flavour to chicken breasts as it´s probably my least favourite part of the chicken…and this one looks and sounds delicious. Your photos are stunning too…really very lovely! Thank you!! Actually, drumsticks are my favorite chicken part, and these don’t need too much seasoning since they have a great natural flavor, whereas chicken breasts are plain and need lots of seasoning! That is the best chicken salad I’ve seen in a long time. Lambs lettuce is impossible to find here (I see it everywhere in Europe) and I love it. 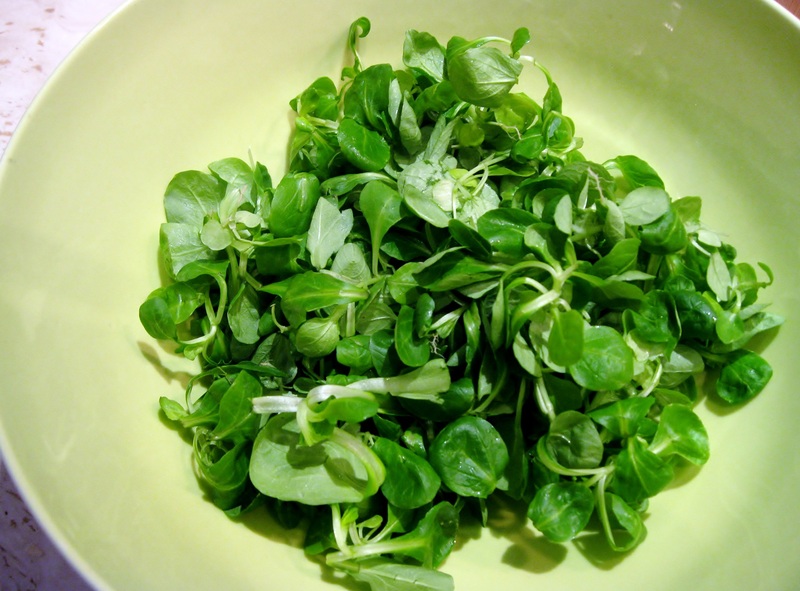 Maybe watercress with it’s small leaves could be used. Your photos are terrific. Oh! Watercress! Sure, I love it! It is almost impossible to find it in Italy!! It would be great for this salad! I love it. 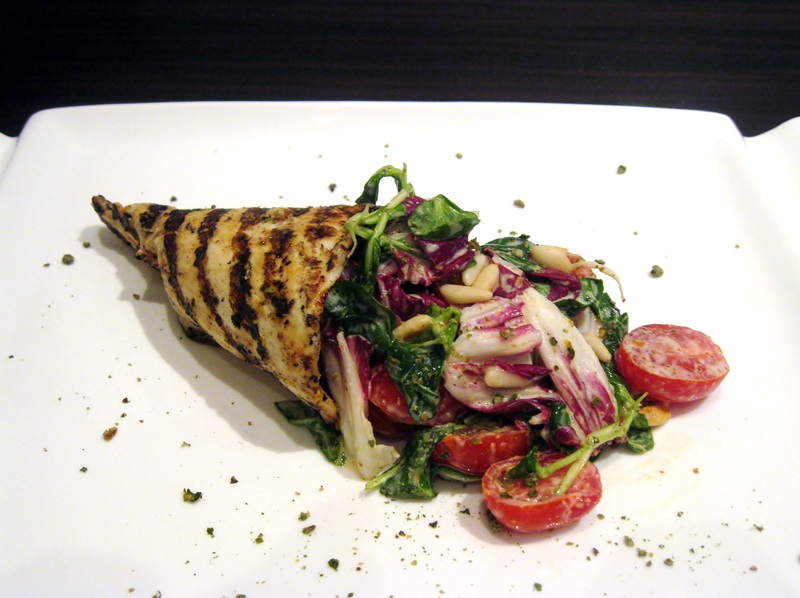 A salad that’s meattastic! We’re cooking a lot on the grill or stovetop these days too. I love grilling and salads!!! This is so very clever and creative! I love the idea to stuff the salad within the chicken, lovely presentation. I too only make my own dressings; I can tell immediately when it’s a purchased vinaigrette! This will be added to my summer salad days!! Thank you!! You can also make a chopped salad! It works out perfectly!!! What a clever idea — and tasty, too! And I totally agree about store-bought dressings. Once I learned how to make a vinaigrette, I never bought another bottle of dressing again. Thank you!! 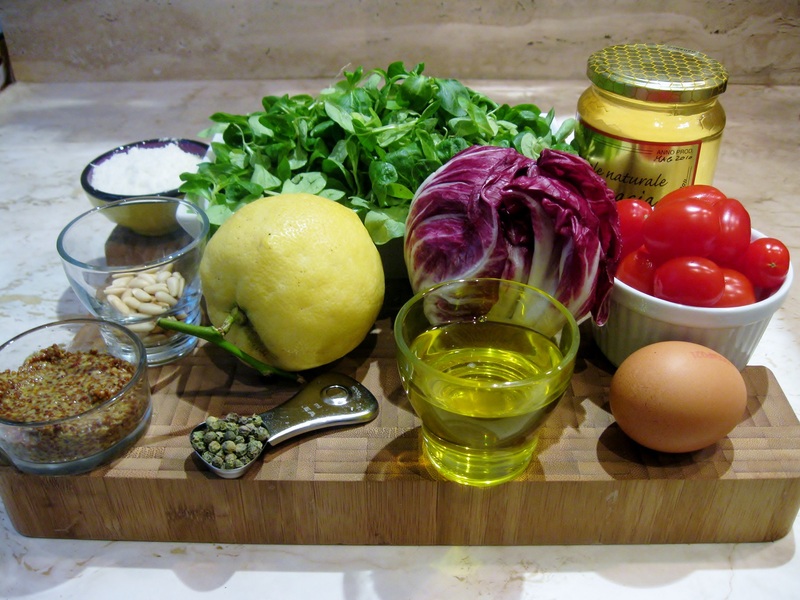 Preparing your own dressings is healthy, but also so much fun! That is beautiful. And it looks very tasty! Thank you!! And thanks for stopping by!